Bangalore: Bhanumathi Narsimhan has been the closest witness to her brother Sri Sri Ravi Shankar’s extraordinary life. Her latest offering is an Amazon best seller already based on pre-orders. “Gurudev-On the Plateau of the Peak” will be released on 11th January, 2018, in which she weaves together fascinating and hitherto untold stories replete with humor and precious insights of their growing up years and all that followed. A book that promises to be a treat for those who are curious about the relatively unknown years of the Gurudev. “A beautifully written biography of the most celebrated spiritual leader of our times, this book seamlessly weaves heartwarming stories from Gurudev Sri Sri Ravi Shankar’s childhood and growing-up years with his philosophy on God, love and existence along with his sustained peacekeeping endeavors and efforts towards women empowerment and inter-faith harmony,” says Debasri Rakshit, managing editor for mind-body-spirit books at Westland Publishers Private Limited. About her association with Sri Sri, Smt. 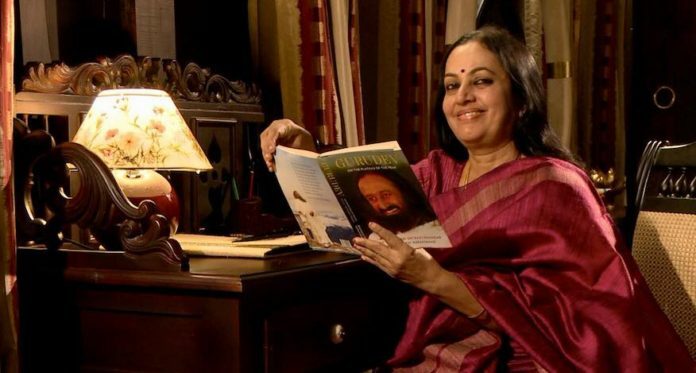 Bhanu, also the chairperson of the International Women’s Conference, says she has always followed Sri Sri, first unknowingly as a child and later with the knowledge, though his words and his steps have always guided her. Born on Jan 11, 1958, in Papanasam, Tamil Nadu, in the same house where Gurudev was born two years apart, she points out that the Sanskrit name for sister is ‘Sahodhari’ or one who shares the womb. “Just the thought that I shared the same womb as him fills me with gratitude and my life continues to be a journey of gratitude and joy from moment to moment!” she says. The book throws light on some of the most interesting questions related to Gurudev’s life that thousands are curious to find answers to-where did his journey begin? What made him step into apparently unresolvable conflicts of political and communal nature? How did he straighten out trust deadlocks among people and communities and nurture belongingness even among outcasts, militants, rebels or prisoners? What was the origin of the popular breathing technique-Sudarshan Kriya and why has it worked for the teeming millions? What makes Gurudev go about serving the millions, unmindful of cynics, naysayers, and critics? Gurudev Sri Sri Ravi Shankar is a renowned global spiritual and humanitarian leader who has spearheaded an unprecedented movement that empowers, equips and transforms individuals to tackle challenges at a global, national, community and individual level with the objective of creating a stress free and violence-free society. In the book, Smt. Bhanu shares an interesting incident-Once Gurudev was doing spiritual practices and she peeped through the keyhole to see what he was doing. She was taken aback by what she saw…To know what happened next, grab a copy of this Amazon bestseller.